At 6:00 A.M. on the morning of November 8, 2000, a colleague and I boarded a plane from Montreal to Havana, Cuba. Like many Americans that morning, we were sleep-deprived and somewhat giddy after spending most of the night glued to the televised roller-coaster ride of the presidential election. The suspense was heightened in our case because we were leaving the bosom of 24-hour cable for a corner of the world where timely and objective news sources were, to say the least, rare. My fellow traveler was Lauren, an intrepid young co-worker. We were met at the José Martí International Airport by Ana María (not her real name), an event planner from a Party-owned tourist agency, who would be helping us with an educational program for students we were charged with setting up. Ana María spoke in rapid-fire tourist agency jabber seasoned with an endemically Cuban mix of Marxist rhetoric and good-natured sexual innuendo. Her canned monologue as she drove us in from the airport (“The Cuban people are very passionate”; “The island is shaped like a sleeping crocodile”) was of only fleeting interest, yet we felt compelled to pay attention (eye contact, nods, murmurs of assent) with the frustrating result that our initial views of Havana were limited to an occasional glance stolen out the window of her Soviet-made Lada sedan. What we did see was the heat-haze of a Caribbean city at midday; crowds of cocoa-skinned people coursing the streets on foot and bicycle; giant murals featuring bearded Revolutionary heroes; and the ubiquitous well-maintained pre-1959 autos. In short, a place like nowhere else in the world; a rollicking commie-Latino time warp. We left our bags at a government-licensed bed-and-breakfast – a casa particular – in Vedado, a pleasant sector of the city that had been a wealthy suburb before the Revolution, and walked out to get some lunch. The streets were shaded by ancient strangler figs and lined with elegant former mansions, though the sidewalks were heaved up and strewn with rubble after decades of neglect. Some of the mansions had been restored to something like their original glory; most languished in states of disrepair and decay, serving either as multi-family apartment buildings or the ad hoc headquarters of minor government institutes. 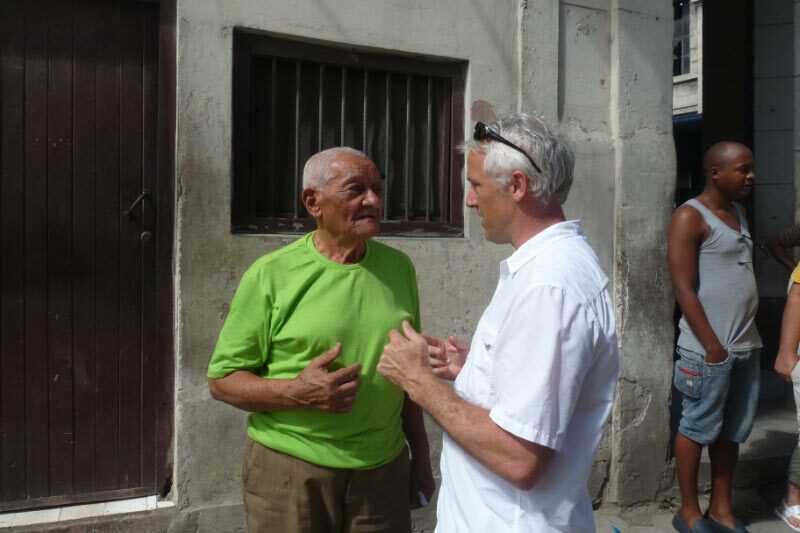 As often happens in Havana, a fellow pedestrian fell in with us and began a friendly conversation. When he heard we were looking for a place to eat he recommended his neighborhood paladar – a private home licensed by the government to serve restaurant-style meals. He also suggested a visit to the Necropolis. We had the afternoon free, so after a good meal of ham and Moros y Cristianos (mixed black beans and rice), we followed his directions to the Byzantine entry arch, which stood within spitting distance of the Plaza de la Revolución, Fidel Castro’s favored venue for addressing the gathered multitudes. 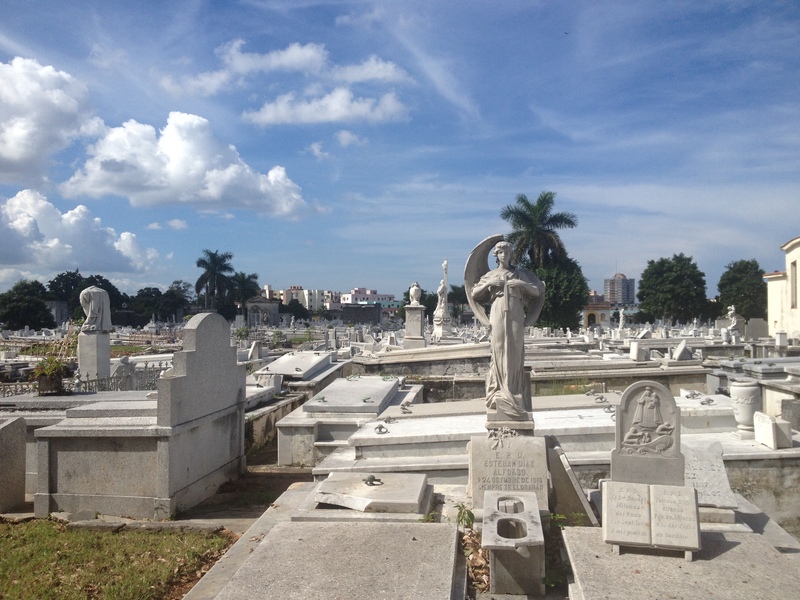 The Necropolis is a vast city of the dead divided into “neighborhoods” by streets labeled with numbers echoing the easy-to-follow grid of the Vedado sector. It’s a fascinating monument, an eloquent metaphor for Havana itself: a place where time and periodic low-grade vandalism have had free rein over physical structures of remarkable historic and artistic interest. Lizards skitter over headstones lying prone or leaning at odd angles; ferns and tropical epiphytes grow suggestively from cracks in dissolving marble. Fanciful, half-plundered crypts built like miniature pyramids or cathedrals with broken stained-glass windows fill the wealthier blocks, while the more most neighborhoods are crowded with beautiful devotional statuary, mostly angels, many of them broken or fallen or tilted awkwardly to one side. Scattered among the tumbled-down monuments and the gaping lids of marble sarcophagi there are clean, no-nonsense post-Revolutionary memorials, but these are quickly overwhelmed by their surroundings: islands of upkeep in a chaotic sea of neglect. We felt as if we’d been beamed back in time a few centuries and then time-lapsed forward to the present. We were worlds removed from the momentous events unfolding a mere 89 miles to our north, and yet something in the fallen statues and ruined crypts seemed relevant. Perhaps it had to do with the inevitable splintering of great societies, or the abject folly of man’s attempts to immortalize himself. Or perhaps it was just the strangeness of spending this particular historical moment in a country that seemed to have withdrawn so comprehensively from the main stream of history. Back at the casa particular I asked our hostess, Lisbet, if she had a newspaper. It hadn’t arrived yet. “Oh yes,” she said. “Who won your election?” Her curiosity seemed mild, as if she were only being polite. “We still don’t know,” Lauren replied with a smile and a rueful shake of her head. “Probably Bush,” I added gloomily. Lisbet gestured for us to sit and poured three cups of coffee. There was something extremely pleasant in the moment, as if it were confirmation that friendship would always trump political divisions. For a moment the unresolved tension surrounding the election receded, and I took comfort in the knowledge that whatever the outcome, it could have no adverse effect on the truly important things in life. Less than an hour later, Lauren and I were walking across Vedado to the Hotel Nacional, a grand resort left over from the high-rolling Havana of the 1920s. 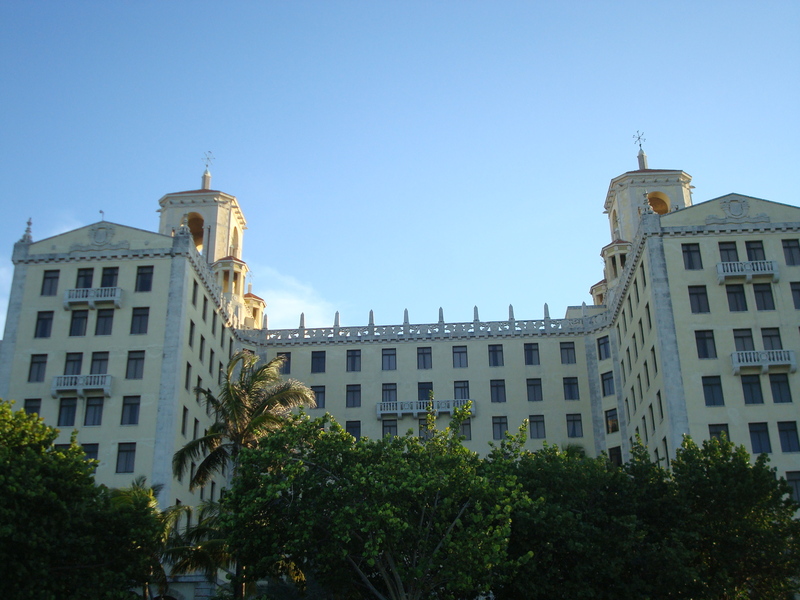 The Nacional is an imposing double-tower built of golden stone, with a pleasant grassy courtyard in back, a perfect spot to sip a mojito under swaying palms and admire the Malecón seawall, along with the panoramic cityscapes of Centro Habana and Habana Vieja in the distance. Our purpose was more narrowly focused; we wanted to find out the latest on the election. The best we could do was that day’s issue of Granma, the official organ of the Cuban Communist Party, so we bought a copy and found a bench in the courtyard where we could sit and read it together. The large-print headline read “El Carnaval Terminó Anoche” (“The Carnival Ended Last Night”), and the lead editorial highlighted aspects of the election that were embarrassing to the U.S.: the major networks’ double-fault in calling the race prematurely, the anti-democratic nature of the electoral college, and the “chaos” sweeping across the country. As far as we could tell there was nothing new, beyond what we’d known early that morning, although we fully expected that by this hour the presidency had been definitively decided. We considered asking the hotel info desk if there was some place we could watch CNN, but that was unlikely, and dusk was melting quickly into ink-black night. We were getting hungry, so we decided to go for dinner instead. A few blocks from the hotel a young man fell into step with us. He had the vaguely intrusive permanent grin of a hustler, and it was obvious that he, unlike our friend who’d recommended the paladar and the Necropolis, was a true jinetero. (“Rider” was the evocative translation for the dollar-hungry Cubans, male and female, who try to sell tourists everything from guiding services to counterfeit brand-name cigars and prostitution.) “Canadá?” he asked. “Eh?” I said, hoping he would leave us alone if we kept walking and feigned ignorance. “Are you from Canada?” he asked, in English. The jinetero shook his head in confusion. We’d come up beside the Copelia, a giant disk-shaped ice cream dispensary perched like a harshly lit alien spacecraft in the middle of a leafy park. There was a line coming out the door of the spacecraft and winding around the perimeter of the park. Nearby was a café we’d noticed earlier; we ducked inside and waved goodbye to the jinetero, cutting short his chance to air whatever proposal he’d had in mind. We sat in the café and ordered a dinner of sandwiches and rum drinks. It was eight o’clock on the day after the 2000 election, and we still had no idea who’d won. It was our understanding that some of the hotels had CNN, and we might have been able to talk our way into the latest news, but by the second mojito we decided ignorance was bliss, and we made a pact to prolong ours for as long as possible. 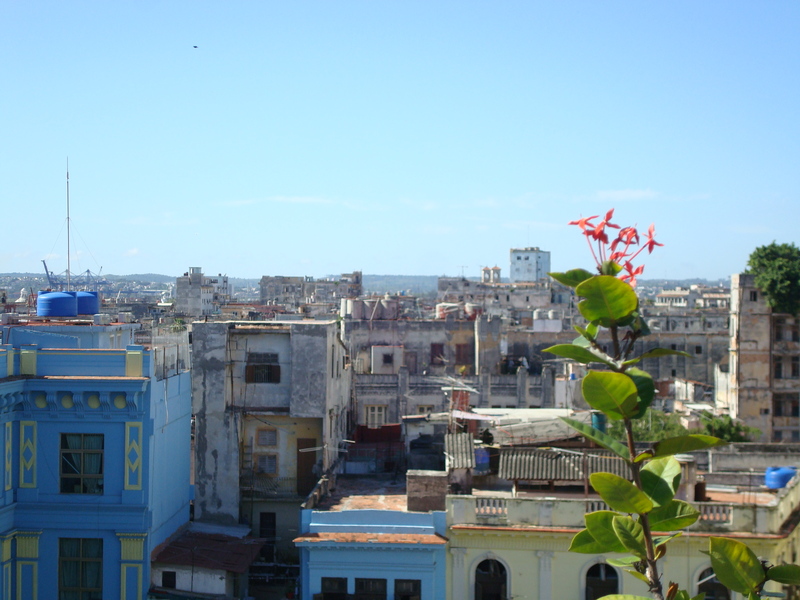 On a previous trip to Cuba I’d been surprised by how cheerful everything was. I’d had this image of the island as humorless, politicized, and bleak: grim Soviet architecture, bad lighting, everyone dressed in army fatigues. I wasn’t prepared for the bright Caribbean days, the deep current of African religious mysticism, the music and laughter filling the streets. It’s curious that the reality of Cuba was so different than my pre-conceived idea of it, an idea that I must assume is shared to some extent by most Americans who have never traveled there. But it’s not really surprising when you consider the lasting influence of the Cold War, during which the travel ban and the virtual media blackout limited Americans’ knowledge of Cuba to propaganda and speculation. And despite the demise of the “Evil Empire,” the Cold War continued on both sides of the Straits of Florida. The day before the election George W. Bush spoke to a rabidly enthusiastic crowd in Miami, claiming that one of his top priorities would be to continue “the fight for liberty in the Western Hemisphere.” The response from the crowd was deafening, because Bush had told the largely Cuban-American crowd exactly what it wanted to hear: that as President, he would continue to uphold the embargo. Not that Al Gore was much more courageous in his pre-election rhetoric. His bald pandering during the Elián González affair made liberals across the U.S. cringe, and probably contributed as much as any other factor to the image that was pinned upon him as a waffling, focus-grouped, finger-in-the-wind politician. The fraud was widespread, according to Granma, and the election called into question the so-called “democracy” of the lumbering imperialist power. A dead man had been elected to the U.S. Senate. Voters had considered initiatives supporting euthanasia, homosexual marriage, and the consumption of marijuana for medicinal purposes. The candidate most likely to become the next president had lost the popular vote. This was a country that presumed to tell the rest of the world how to run a democracy? It was strange to be getting our news from Granma. One had to read between the lines, then go back and read between those lines. Like most effective propaganda, the newspaper was clearly based on reality, so it was safe to assume that the horse race was still on. But had there truly been widespread fraud in Florida, or even a few electoral irregularities? Either way, a recount seemed to be in order. We were curious as to the perspective at home: how were the opposing camps spinning it? That afternoon Ana María picked us up in her box-like Lada to takes us on a tour of various facilities we were looking at to host the group. Apart from the pre-1959 Chevys and Fords and Cadillacs, Soviet Ladas of a certain vintage were the most common cars on the street. Ana María was very proud of hers – she called it her tanque de guerra (war tank) – and it was an admirable machine, a battle-scarred heap of ugly practicality with an odometer jammed at 99,999 and a few hundred thousand miles still to go, with the help of Cuba’s mechanics who were, by necessity, the best in the world. We celebrated a successful afternoon with drinks at La Terraza, a pleasantly airy bar and restaurant overlooking the small fishing harbor that inspired Hemingway’s The Old Man and the Sea. The restaurant is one of several old haunts the Cubans have preserved in honor of the fallen author, who is considered a national hero only a notch or two down from Che Guevara and the young Fidel Castro. Ana María kept up a friendly monologue, among other things confirming our early impression of her as a party-line communist. Her speech was peppered with stock phrases such as “the triumph of the Revolution,” and “fatuous bourgeois mansions,” in somewhat striking contrast to her outward persona, which reminded me of a slightly naughty Atlanta real estate agent: shoulder pads, matching skirt of a sensible but flattering length, high heels, generous lipstick, and that flirtatious gaze. 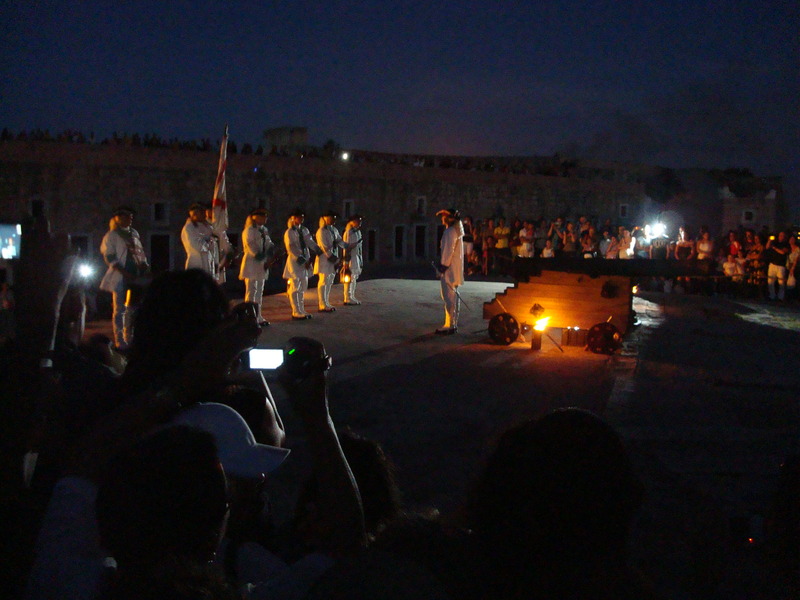 In the evening we took in the cañonazo atop the Morro, the great eighteenth-century fortress overlooking the harbor. For centuries Havana was the administrative seat of the Spanish Empire in America, a fact that begins to explain the city’s astounding architectural heritage. The cañonazo is rooted in the age of Caribbean privateers, when the city was enclosed by a protective wall and a single cannon shot every night at nine warned inhabitants that the gates were closing. The ceremony is something to see: a platoon of white-wigged soldiers in scarlet tails and tricorn hats goose-stepping by torchlights; tall shadows on the time-worn sandstone walls of the fort; a sparking plume from the gunpowder fuse and then the cannon shot, a tongue of fire over the blackness of the harbor, followed by music and a rumba in the grassy courtyard. The whole thing is orchestrated by the Cuban military, but there’s something appealingly tongue-in-cheek about it – the young soldiers really ham it up with their goose-stepping – and one gets the feeling that it’s less an exercise in nationalistic pride than a way to poke fun at Spanish imperialism. And of course it’s an excuse for dancing on the grass. It was the morning of November 10, and we were still in suspense. So was everybody else, but we had no way of knowing that. We assumed people back home knew or would know soon, but the day’s Granma gave us no hint: the only U.S. election story was tucked into a corner of the back page and held no significant revelations. In a neat bit of irony – given the key role of the Cuban-American community in this election, and in keeping in place an otherwise nonsensical policy – the lead story was that the United Nations had once again resolved that the U.S. embargo against Cuba should be called off. The vote was 167 to 3, with the only dissenting votes coming from the U.S., Israel, and the Marshall Islands. We had a few errands to run in Centro Habana. To get across town for an appointment in Habana Vieja, we opted for a bicycle taxi, a mode of transport that emphasized an ever-present motif in contemporary Cuba, that of the functional anachronism. On the narrow streets in the older parts of the city bicycle taxis were more common than autos, although only a small minority were licensed to carry tourists. The drivers pride themselves on their athleticism and engage in frequent road races. Our driver, swarthy and square-jawed with a serious intensity to his gaze, was unique in our experience in that he actually initiated a conversation on the topic of Cuban politics. “Are you communists?” he asked after a few blocks of pedaling. He pedaled us through the dingy splendor of Centro Habana, where grand old townhouses cry out for their first coat of paint since the Revolution, to Habana Vieja, a Caribbean version of a Spanish casco antiguo where venerable 18th century cathedrals and captaincies have been restored and spiffed up for tourism. Unlike the taxi driver of the night before and indeed, unlike most Cubans we talked to, he was quite sympathetic to the Cuban-American community. He posited the example of an industrious shoemaker who’d toiled and toiled to build his business into a successful department store, only to have it confiscated by the Revolution. The entrepreneur had fled to Miami. His store was now owned, not by Cubans, not by Americans, but by Italians – a nationality whose tourists had somehow managed to thoroughly annoy many Cubans in the brief time they’d been traveling en masse to the island. The driver would be happy to see more American tourists, he said, but the governments were keeping the citizens of the two countries apart. Despite hard times there was less open dissidence than you might expect, and in the hearts and minds of most Cubans the romance of the Revolution remained to some degree intact. That evening, for example, we had dinner on the glassed-in second story of a lovely French-style Vedado mansion. The hostess was a radiant beauty, with glittering brown eyes and the slim dark grace granted only to certain fortunate women of the Spanish diaspora. We were her sole customers. In murmured snatches of conversation as she brought us mojitos and delicious cheese-encrusted fillets of snapper, we came to know her as the kind of flower that could only bloom in contemporary Cuba. Like many of her compatriots, she had to hold down more than one job to make ends meet: she was an orthodontist during the day and ran the paladar at night. She was also a poet. “What kind of poetry do you write?” Lauren asked. 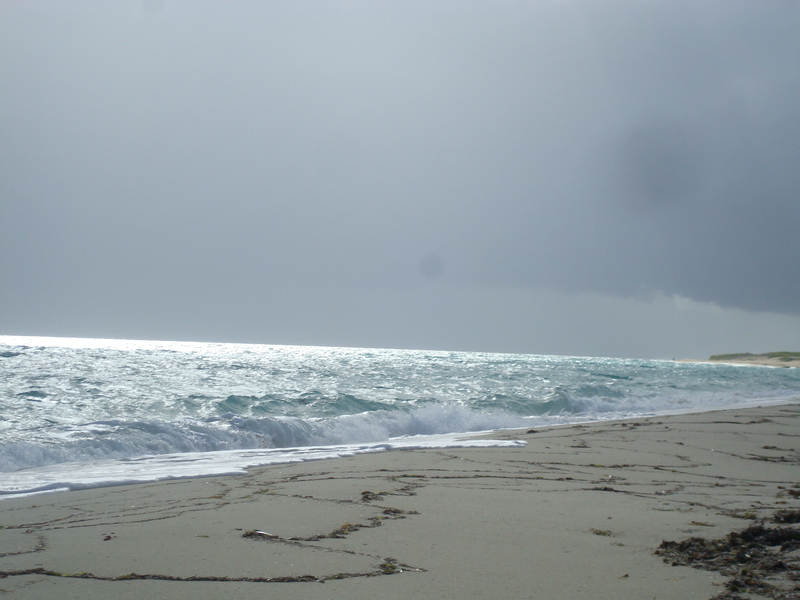 The next morning, with a vague feeling of recklessness owing to our continued ignorance of the election results, we left Havana for a four-day planning trip to the countryside and beaches several hours southeast of the city. The highway was surprisingly well-maintained, a wide and mostly empty strip of asphalt cutting through the tropical-green terrain, which is flat and then begins to roll as one approaches the mountains around Trinidad. The architecture was similar to that found elsewhere in the Latin Caribbean: some remnants of the old hardwood-and-thatch but mostly standard-issue 20th century cinderblock and corrugated tin, not a complete blight in Cuba because the walls are whitewashed and the houses surrounded by well-kept patios and gardens. Strategically placed on roadsides throughout the country were the official propaganda billboards, extremely eye-catching because of their militant anti-imperialist slogans. For those of us who grew up in America during the Cold War, stylized images of a rifle-waving proletariat are apt to trigger deep-rooted associations of evil, but for Cubans, one assumes, the billboards melt into the background, like telephone wires of McDonald’s arches in America. Once you get used to their stridency the billboards actually enhance the touristic interest of the landscape, like the vintage cars, the horse-drawn taxi carts, and the brightly dressed multitudes lining the roads looking to hitch a ride. With such visuals, you never forget which country you’re in. Back in Havana we had a few days to consult the latest editions of Granma. The November 14 edition featured a photo of three extremely thuggish-looking Florida policemen standing with their arms crossed in barely concealed impatience over a table of elderly ballot counters. The caption read “Electoral College in Volusia County,” and the overall effect was chilling, accompanied as it was by an editorial alluding to the inherent instability of the U.S. democracy. After reading the article we wouldn’t have been surprised to arrive back to a nation in violent turmoil, with protesters burning the Constitution on street corners and steel-helmeted riot squad waiting in the wings. As it turned out, the situation wasn’t quite that bad in America. When we did get home, political passions were running higher than when we’d left. Everyone seemed frazzled and punchy. The rhetoric on the airwaves had turned pretty hot, and everywhere we went – gas stations, restaurants, roadside diners – people were discussing the election. A whole new lexicon had emerged, along with a grim cast of characters: canvassing boards, dimpled chads, butterfly ballots; Katherine Harris, James Baker, David Boies. I understood from my wife and others who’d lived through that first week that events had seemed almost unbearably momentous; for the first few days at least, it had been nearly impossible to pull oneself away from the television or the radio. I was glad to have missed it, not only because I enjoyed the strange Sleepy Hollow sense of having been away for much longer than a week, but also because my accidental withdrawal from events that had been unfolding hour by hour allowed me to assess the political milieu with a fresh (though by no means unbiased) perspective. In other words, I could judge the situation on its own terms, rather than according to how it had developed. It struck me, as I watched the spokesmen from the opposing sides, that spin is not related to propaganda – it is propaganda. The political team most adept in the practice of deliberately distorting the truth – convincing a majority of the public, for example, that a hand recount is flawed enough to be worse than no recount – was the team that would emerge as the winner. I’d been home three weeks by the time the Supreme Court handed Bush the presidency, but I can guess what the Granma headlines would have said. And I’m afraid that neither spin nor propaganda would have been necessary to make the usual point about America. This article originally appeared in Middlebury magazine.